If communion is being served in the pews, please stay seated. An server will pass first trays with the bread, and then the wine to you. Take a piece of bread, and pass the tray along to the person sitting next to you. Once the congregation has received the bread, servers will return to pass trays of wine. Note that there is also grape juice available on the tray. You are invited to eat the bread and drink the wine as you are being served. Should you wish to not take part, simply pass the trays along without taking anything. If communion is served by intinction at the front of the sanctuary, those wishing to partake will move forward along the center aisle beginning with the front pews with each pew following in turn. There is no rush; take your time to walk to the front of the sanctuary, where our pastors and communion servers will be waiting for you. 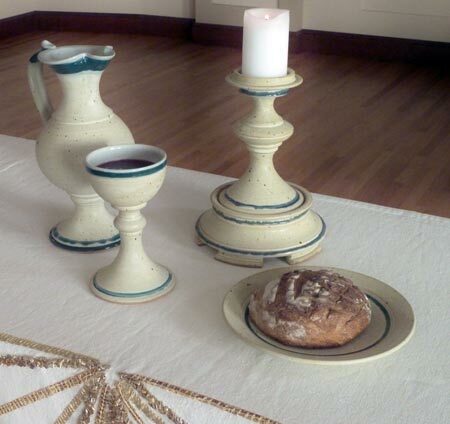 A piece of bread will be offered to you with the words, “the bread of life.” Wine and grape juice are offered next, with the words, “the cup of salvation” – please dip your bread into the wine or juice and eat it. Feel free to respond to the words with, “Amen” as you return to your seat. Those who do not wish to receive communion may remain seated or may move forward to receive a blessing, indicated by crossing your arms over your chest. Should you not be able to make your way to the front of the sanctuary, an usher will ask if you would like communion brought to you in the pew. While we are waiting for all to be served communion there is quiet time and a musical interlude for you to pray individually, if you wish.